The paint and bed & bath areas have been entirely cleared out, including the paint mixing area. Also, the back section of apparel adjacent to this is now covered up. The general merchandise side is moving stuff around to random spots. 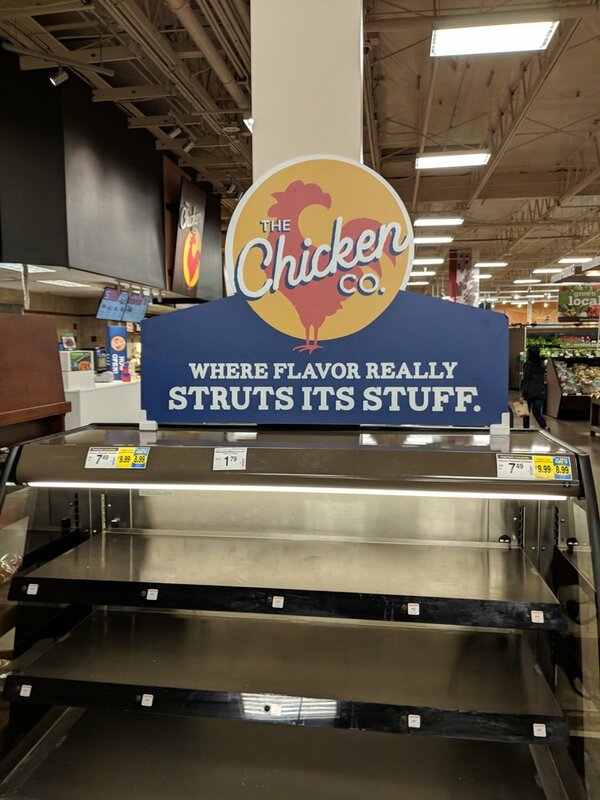 Grocery hasn't changed anything at this point. While some have mentioned certain departments becoming smaller, the storage containers out front make me think otherwise, that stuff is simply being stored there as departments are remodeled. A good portion of the front parking lot is now occupied by them. I really hope that Kroger doesn't butcher this one up like they did on Lancaster in Salem. It would make some sense to make a nicer experience here since Longview has two Walmarts and shopping options (mainly non-grocery) in the area have become more limited in recent years. "the storage containers out front make me think otherwise, that stuff is simply being stored there as departments are remodeled. A good portion of the front parking lot is now occupied by them. " The storage containers is how the new fixtures, shelves, refrigerators and all other equipment are shipped to the stores for a remodel. It's standard practice in the industry today. They are not used for product storage. I know the Bellevue Fred Meyer store had a number of storage containers on the side of the building in the parking lot for a long time, years before the store was remodeled. I don't think they're still there after the remodel (which added a fair bit of space to the building), but the Kirkland store was remodeled several years ago and still keeps containers out in the parking lot. Based on that, I'm guessing that at least some stores do in fact use these containers for long-term storage. Longview has had a few on the grocery side for a while. But they recently brought in at least 10 or 20 of the things and have cordoned off a good sized portion of the front parking lot to accommodate them. Depending on how long the remodel takes, it could make for a challenging parking situation as back to school shopping ramps up. While I can't speak for the finished product in Longview just yet, because it is still in progress, I will say that the conversion to polished concrete is revealing some very bad looking patch jobs, including one right as you walk in the general merchandise side which is much lighter than the surrounding concrete. It really sticks out. There are others, but this one is really bad looking. 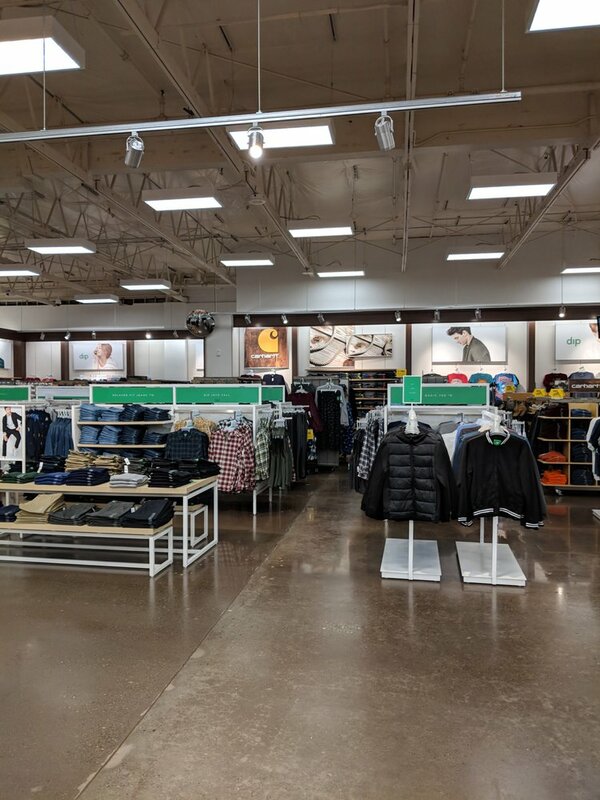 Another interesting observation is that they are installing a dairy cooler in the back of the former apparel area, near the new home of Health & Beauty, and apparently keeping a dropped ceiling in this section as they have installed new grid on the new wall above the coolers. 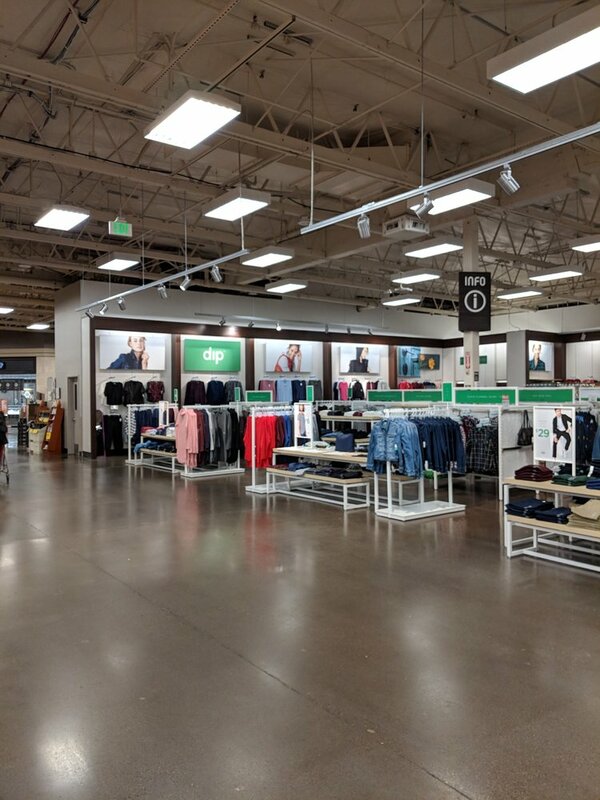 But they appear to be keeping the open ceiling in the rest of the store, and there are spots where they are preparing to change out the lighting as I see new conduit appearing in the general merchandise side. They are, however, already repositioning grocery aisles and making them wider, as if the whole goal of the project is to place more emphasis on the food side while scaling everything else back. The new dairy coolers are now in use, the picture shows an adjacent area that is not finished yet. The Tigard Fred Meyer was last remodeled in 2010. The drop ceilings were removed during the 2001 remodel when the building was enlarged and the separate home and garden center was removed. 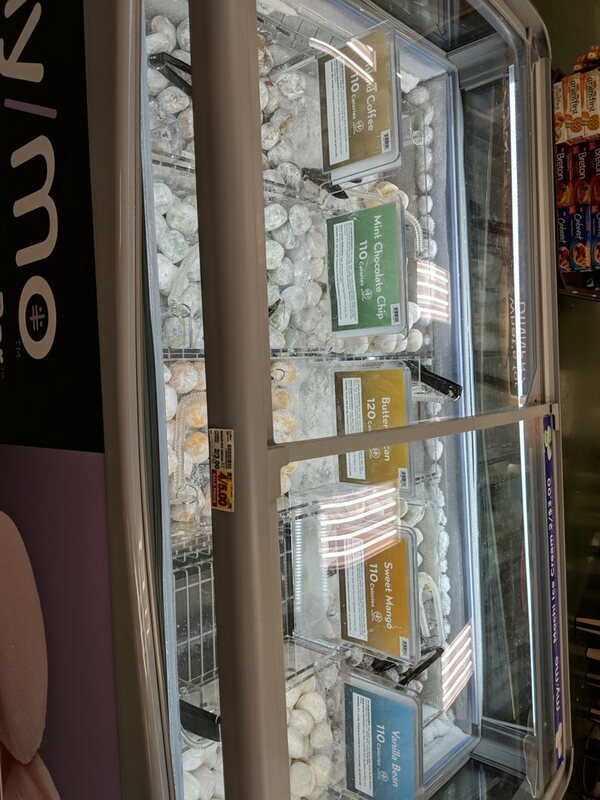 With Fred Meyer expanding food in all of their stores, this one currently has one of the smaller food departments in the chain. Natural Choices is a fraction the size of their latest stores. The apparel department is remaining after the remodel. It's only been removed to provide space to make the remodel happen. They did the same thing during their last remodel. Furniture, electronics are going away. Home is getting smaller. The layout got goofy when they closed off the entrance for Click List. This should fix that. Here are some photos of the finished store. 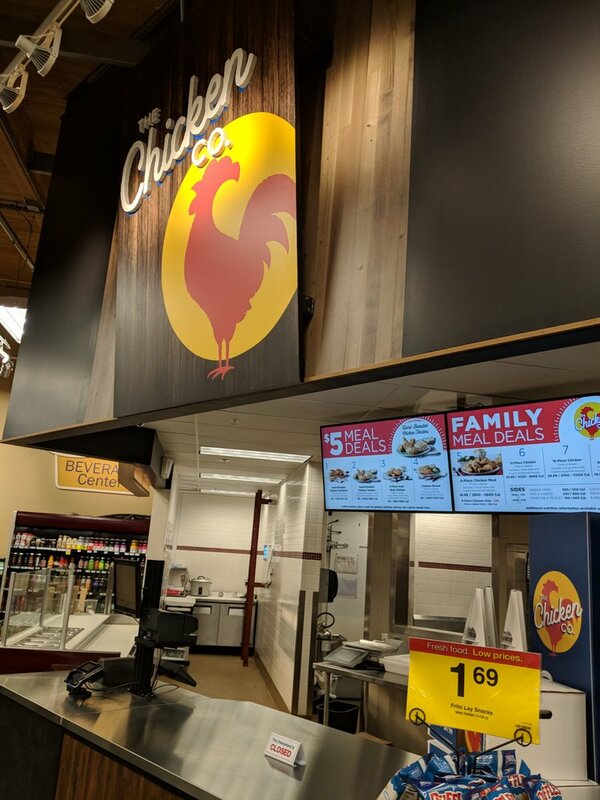 "Natural" foods are integrated into the main store as well as a new image for the deli's chicken offerings. The ClickList entrance did not reopen and Fred Meyer seems to be closing off exterior pharmacy walk up windows as well. The store how has 2 entrances, a food door that is kind of center to the building and a home entrance next to the garden center. 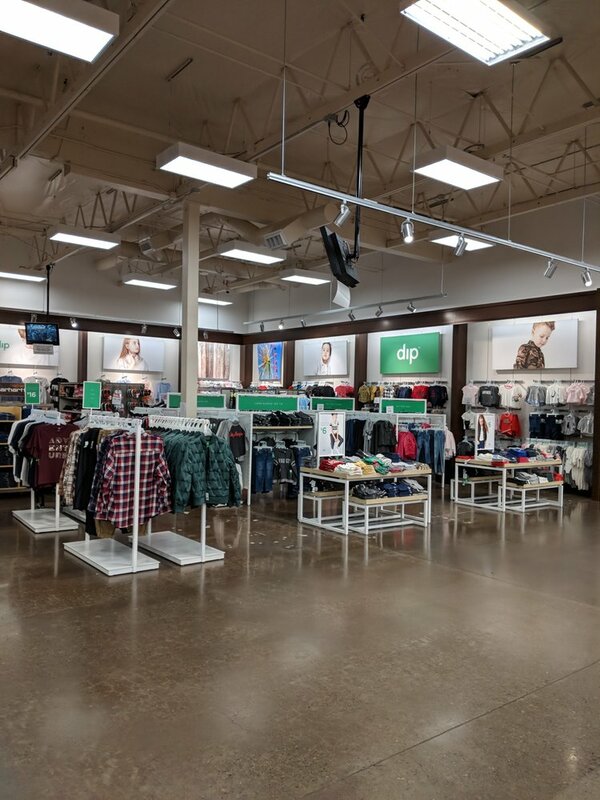 These 'dip' apparel departments look just like Joe Fresh but with green and white instead of orange and white. I hope Kroger does fine with them. JCPenney was very quick to discontinue the ladies (and children's) JF departments. The brand is still in Real Canadian Superstore as far as I know. nearby produce department is laid out better, I'd say. Peet's dropped for Starbucks (sigh) and sushi island removed. Seating area is now "Starbucks" furniture. They have added more self-checkouts including at the general merchandise end. One troubling sign though is that it looked like it was forced self-checkout on the general merchandise end. The food end has added more self checkouts (and updated the existing ones) and has also added all new regular checkstands. The lighting is something I am trying to figure out. They have (on the GM side) added, and powered up, a few new sections of lighting, but haven't removed the existing lighting yet, and the dropped ceiling in the center of the store has some 4 foot fixtures where the silver reflector covers have been removed and new LED tubes installed, but also square fixtures with existing U tubes still in use. Food has had no lighting changes. The former Electronics section (now apparel) has new fixtures with white reflectors, but the other half still has the silver reflectors (which oddly have been changed to LED tubes already) Much of the store now has been redone as far as the new polished floors and new aisle locations, new wall painting, and new aisle hangers, but I have noticed no ceiling painting taking place, and I find it interesting that they aren't at least updating the lighting while sections are emptied out instead of snaking their lifts around new shelves with merchandise. I also find it odd that the new dairy cases as well as health and beauty are now in their final area under part of the former apparel area which has retained the dropped ceiling but hasn't added any new lighting. Deli has been awkwardly placed into the seafood area while the deli is rebuilt. It doesn't look like any hot food during this time. They have added new, wider doors at both ends of the store. I will reserve judgement of the whole project until I see the final product and which direction they go with the lighting. Except for the floors. They look terrible and no new lighting will change that.